Assemble Marvel's Avengers to defeat man's mightiest foe - Ultron! 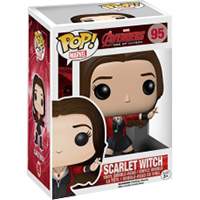 Collect the whole team, including the Avengers Age of Ultron Scarlet Witch Pop! Vinyl Bobble Head Figure! Also known as Wanda Maximoff, Scarlet Witch measures approximately 9.5 cm tall. Ages 3 and up.